The underlying issue being considered is whether OCS can have a positive impact on social development. On that basis, the project aims to contribute to respond to the central question: what are the institutional, political, and cultural issues involved in the adoption of the OCS approach for local development targets? What are the perspectives of local stakeholders on development? What is the role of science in their view points? What characteristics of local contexts frame the specific conditions for the adoption (or not) of OCS by scientists and other local groups? What factors promote or hamper the dialogue between scientific groups and other stakeholders for OCS? What are the local dynamics and practices of knowledge production? How do they relate to open science approaches and practices? What kind of open science are we talking about? 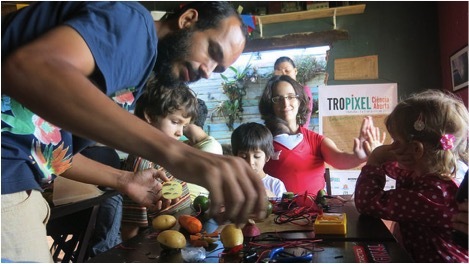 The project’s objective is to undertake a process of critical reflection and practical learning to promote OCSD efforts, by experimenting with community-driven initiatives within the Ubatuba municipality, in the State of São Paulo, Brazil, and through mapping, characterizing, and analyzing the main issues involved in them. The Open Science movement expands worldwide and, more recently, also within the so-called emergent and developing countries, or the Global South. In these countries, the debate on science and technology´s role for social development is not new, as expressed in well-known notions such as appropriate technologies, social technologies, and social innovation, among others. A recent novelty in this field resides in the still incipient but growing dissemination of experiences valorizing the adoption of open and collaborative knowledge production methods and practices as a key condition for their sustainable and participatory implementation, from a bottom-up perspective. On the other hand, development challenges also mobilize and propitiate new opportunities for science to experiment with more open and collaborative approaches. However, since this is a new phenomenon in Brazil, there is a scarcity of knowledge and systematized information about these experiences, their potentialities, obstacles, and requirements. The project´s methodology is based on an action-research approach along two axes: community intervention and critical analysis. Both mutually supportive axes are developed simultaneously. Practices, ideas and assumptions will be observed and changed where necessary, in mutual feedback through ongoing discussion and open documentation, producing change while advancing understanding (“learning by doing”) of the process as we go along. Axis 1 seeks to provide practical learning by experimenting with community-driven OCSD initiatives in Ubatuba. Axis 2 will generate critical reflection and knowledge on community-driven OCSD initiatives in Ubatuba. These are the main challenges we have faced along the project development. We consider that we have successfully overcome most of them. Considering our action research approach, our main ethical concern, since the beginning of the Project, has been to make it clear to local stakeholders what are our objectives, possibilities and limits in a very transparent way. We soon understood that trust must be carefully constructed with each of the stakeholders and among themselves. Another ethical and political issue is to balance our propositional role with the necessary limits of our intervention and leadership on local issues and debates. In other words, we are one of the local actors, but with specific attributions in local dynamics, aimed at testing and debating open and collaborative practices and values. Also, we have to evaluate, at every step, what information must be made public (in our wiki, blog, mailing list, and social network) and which should be preserved so as not to expose our partners to sensitive situations. We had initial difficulty in approaching traditional and consolidated research institutions. The involvement and participation of students (younger generations) facilitates that collaboration. There are barriers to dialogue among different stakeholders, especially between scientific communities (mostly coming from other cities and regions) and local social groups. We have faced the challenge of dealing with diverse groups and generational extracts, with diverse skills and interests to adopt new tools and open platforms. We noticed the lack of or precariousness of accessible local communication and digital information infrastructure and technologies, as well as the low level of organized public and governmental information, data sets or open data platforms. Open science is not a single “umbrella term”. Its diverse aspects are integrated when they are mobilized to respond to local development challenges and demands. It is not OCSD that creates inclusive spaces for marginalized groups. These groups create, in innovative ways, new spaces and new knowledge production dynamics. OCS should recognize and dialogue with them. There are no accessible tools nor open platforms that respond to the various media and possibilities of collaborative production. A considerable part of the hacker community does not manifest that much interest in investing effort to develop open platforms for scientific-academic purposes or to develop open solutions for scientific institutions’ demands. We redefined the project focus on the porosity of science to dialogue, contribution and influence from other types of knowledge and different cognitive actors. We expanded our conceptual framework from open science to common science (as proposed by Antonio Lafuente), stressing the relationship with the diversity of modes of knowledge production, which expresses the diversity of modes of existence and living, of living in community and dealing with nature, therefore different perspectives about development. Although the term “open science” was not used by local groups, we observed the existence of practices and values regarding openness and democratization of knowledge as central aspects of their local development strategies. Having access to scientific and technical knowledge is a key factor in the empowerment of social actors addressing local development issues, especially in controversy and conflict situations . University researchers are often mobilised by managers and community councils to assist in the preparation of reports and analyses which can qualify their position on controversial issues. Scientific expertise is also often mobilised to provide visibility and legitimacy (as a form of certification) of social practices or community knowledge demanding political recognition.